A few years ago, I was traveling to Toronto by bus. I was on my way back to books and classes at the university. I dreaded going back to school. I whined and complained to myself that I was not ready to go back to school. After a while, I got tired of my own whining and closed my eyes. I tried to enjoy the ride, but let's be honest: it is very hard to enjoy a ride on a Greyhound bus. I still had a few hours before I arrived at my destination, and I felt suffocated with the misery of my thoughts and the horrible smell in the bus. It was also quite surprising that I could hear my own thoughts amidst the snores, people speaking loudly on the phone and the background music. It was pandemonium. I had nothing better to do; I could have prayed, slept or counted cars and power poles, but I did not. I started to read the book and I began to enjoy it within a few minutes. About five minutes into it, I came across Rubin's motivation to write the book. 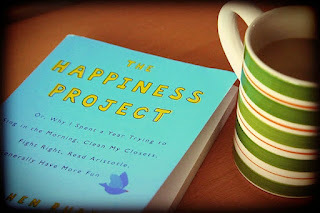 She wanted to share with readers not only how to be happy or what sort of “happy things” she did; she wanted to tell her readers why she was happy. She wanted more from her life. She once had a thought when she was struggling with a few setbacks in her life: “What do I want from life?”, she asked herself. “Well...I want to be happy.” That awareness filled her heart. She realized that happiness is a project. In her own words, happiness is the very purpose of our lives. We come to earth to learn to be happy and share that happiness with others. While I do not fully agree with Rubin's concept of happiness or where it comes from, I have embraced her main idea: happiness is a project. Happiness is an enterprise and we need to have a plan to achieve it. The enterprise is the building of God's kingdom on earth, and the plan is not one that we can create, schedule or outline, but one that we discover. Our happiness is directly linked to the fulfillment of God's plan for us. I was reminded of that by Pope Francis' Pentecost homily. The Holy Father called us to be open to “God’s surprises” because they bring true happiness. “Happiness is not a question of novelty for novelty’s sake, the search for something new to relieve our boredom, as is so often the case in our own day,” the Pope said. “The newness which God brings into our life is something that actually brings fulfillment, that gives true joy, true serenity, because God loves us and desires only our good,” he stated. The newness that God brings in our lives, the ways in which he loves us and communicates life in our lives bring fulfillment and true joy. That is the very foundation of real happiness. Pope Francis reminded me that we need to go back to the basics in order to be happy. We need to understand the foundation of real happiness and to change some of our habits in order to become more spiritually free and more open to the newness God desires for us. Throughout the years, going back to the basics has been very important for me. Let me share some of the lessons I have learned in my happiness project – my pilgrimage with Jesus the Christ, the joyful giver. Happiness is a foreign concept when we are too busy fearing (change, people or events), impressing (or trying to impress others), clinging (to what we know, who we know and our comfort zones). We need detachment and spiritual freedom. Discernment is the best way to achieve those. We have many needs in our lives. We need both certainty and uncertainty. We need to have certainty about some things: my car will start the next time I use it. If we become too attached to the idea of absolute certainty, we will become miserable and we will close ourselves to God's surprises. This is the reason why we need uncertainty. Most people say they love surprises, but I think people only like the type of surprises they enjoy; all other kinds of surprises will be labelled as a problem. Openness to God's surprises is a way to see them all as sources of joy, transformation and healing. Many people live by the maxim: Life is all about increasing pleasure and avoiding pain. We may make decisions depending on how we feel about them. But pleasure is not happiness. While getting what you want may give you pleasure, it doesn’t make you happy. If you don't believe me, ask rock stars. I used to think that happiness comes from lowered expectations; but in doing so, I close myself to many of the ways in which God wanted to surprised me. Lesson learned: dream the impossible dream. I have learned that if I want to be happy, I need to do the things that make me happy. When I first realized this I drew a blank on those things. It took some time for me to reflect on the things that make me happy– not the things that bring me pleasure, but the ones that make me happy. For me, these things usually include time with people I love or care for, as well as time outdoors or contemplating something beautiful. The awareness of what makes us happy is not enough to bring us happiness. We need to do them. I have found that scheduling these things in my weekly calendar has helped me to get them done. It has brought fulfillment in my life because as I was busy planning my happiness, God's surprises happened. One of my favourite professors used to tell us: If you aren’t growing, you are dying. I have learned that true and lasting happiness is quite simply this: progress. True happiness comes from growing in all areas of our lives. It is a holistic approach to happiness. We need to sleep well, eat a balanced diet, exercise regularly, stop procrastinating, and pray daily. True happiness happens to us when we grow in intimacy with the source of all of joy. As Pope Francis reminded recently, Christian joy is a gift from Jesus. Happiness is a project. We are created to praise, reverence and serve God. God's surprises happen to us through this process. These surprises bring us fulfillment and real joy. As we help to build God's kingdom on earth, the Holy Spirit transforms us and fills us with joy and peace. Happiness is both an enterprise and a plan. As we let God's plan for us take flesh in our lives, we learn to appreciate that God dwells and labours in all things, and we rejoice in finding him in them. You make it sound so easy. To me it seems happiness has to do with issues of self-image. I keep trying to get rid of what society tells me I ought to be and look like. How do I do it? I totally forgot to reply to this here, since we talked about it the other day. I would repeat what I said before. The world is constantly giving us images and role models that are not life-giving, inspiring or uplifting. If we do not conform to them, we are told, you are fat, ugly, useless, unwanted and not good enough. Christ on the other hand is always saying You are good, beautiful, true, and loved.